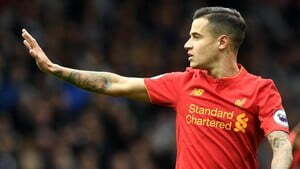 Liverpool playmaker, Philippe Coutinho, has repeated his insistence to the club, about a move to Barcelona in what would be the new British transfer record. Coutinho, who has scored 12 goals and provided eight assists in all competitions this season, failed to seal a move away from Anfield last summer. However, he is adamant on leaving the Reds, after five years at the club. Given Coutinho’s attitude and application since submitting a transfer request in the summer, the Brazilian feels it is only fair for Liverpool to accede to his request to leave. The Premier League club is trying to persuade the player to stay, by presenting multiple incentives and a greater wage packet to their highest earner. If everything proves unsuccessful, Liverpool may be forced to sell their star man. Manager Jurgen Klopp noted in August that “in life everything is about timing – whichever club asks early enough. If you ask early enough, you can either switch the plan or whatever. But you cannot come up, close to the start of the season and things like this. It’s like I said: the club is bigger than anybody. That is the most important thing.